Cal State East Bay was no match for the No. 9-ranked Tritons as UCSD crushed the Pioneers 6–0 in Pioneer Stadium. The Tritons scored three goals in eight minutes to easily win their 11th match in a row. Cal State East Bay fell to 3–10–3 overall and 2–8 in league games. All six goals were scored by different players, with junior forward Katie O’Laughlin scoring her region-best 14th goal as well as a career-high three assists. 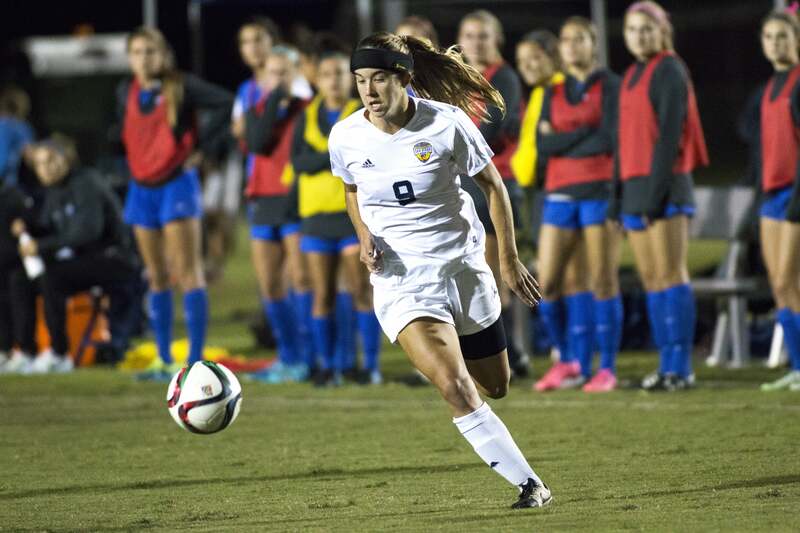 UCSD’s record now sits at a perfect 10–0 in CCAA play and a 14–2 overall. In their eleven-game winning streak, eight of the victories have been shutouts. During this streak the offense has been stellar as well, as the team is outscoring opponents 32–1. Should the Tritons win their final two games, they will be the first team since 1998 to win all of their CCAA matches. The victory for UCSD also means that the team clinched a top-two seed in the CCAA tournament and will have a first-round bye. The Tritons will head to Turlock on Nov. 4 to defend their title from a year ago. Redshirt senior goalkeeper Itzel Gonzalez made one save to earn her 12th clean sheet, which is the most in the league. Sophomore forward Mary Reilly started the scoring with her third goal of the weekend. The goal was set up by O’Laughlin, who passed it to Reilly; she promptly drilled it into the top right corner. It was Reilly’s ninth goal of the season. Just a few minutes later O’Laughlin sent a cross deep into Pioneer territory, and junior midfielder Elisa Martinez put it in the back of the net for her first goal of the year. After two early assists, O’Laughlin gave the Tritons a 3–0 lead in the 28th from an assist from redshirt sophomore forward Kiera Bocchino. The scoring continued in the half for UCSD. Senior midfielder Kristin Sampietro got a layup in front of the goal as a left-sided pass from sophomore midfielder Summer Bales enabled her third goal of the year. After halftime O’Laughlin sent in a ball from the left, and junior midfielder Jordyn McNutt scored in the upper left corner to give O’Laughlin her third assist of the game. Freshman midfielder Roni Merrill added the final score in the 85th minute on her second-ever college shot. The closest the Pioneers came to scoring was in the 62nd minute, when their senior forward Megan Ravenscroft shot hit the post. Cal State East Bay had another chance when a corner kick headed toward the goal, but junior defender Makenzie Brito was in the right spot to clear the ball from danger. UCSD’s goalless streak has passed an unfathomable 745 minutes. Other impressive milestones from this historic UCSD season include that the shutout is the longest since the Tritons entered Division II in 2000. The team has scored two or more goals in 12-straight games, which is a record in the Division-II era. UCSD has outscored opponents 48–6 this year and 32–2 after halftime. It may be time to consider this Triton team to be one for the history books. It will depend how the Tritons finish in the playoffs, but we may be looking at the best women’s soccer team in school history.